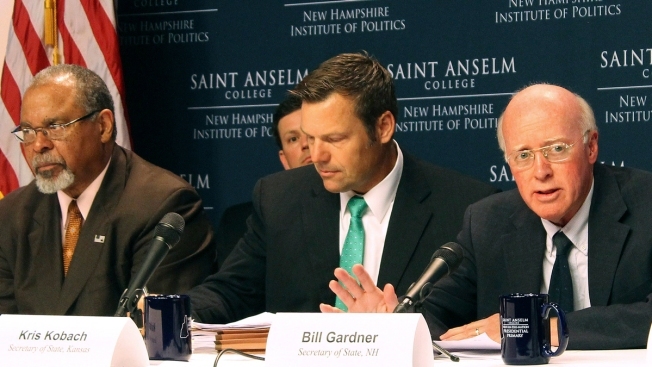 In this Tuesday, Sept. 12, 2017 file photo, New Hampshire Secretary of State Bill Gardner, right, introduces one of the speakers at a meeting of the Presidential Advisory Commission on Election Integrity in Manchester, N.H. Kansas Secretary of State Kris Kobach, center, and former Ohio Secretary of State Ken Blackwell, left, also attend. The information coming out of President Donald Trump’s commission to investigate voter fraud has frustrated not only reporters and senators but now even members of the commission. A federal watchdog agency will investigate President Donald Trump’s Election Integrity Commission, it was announced Thursday. The Government Accountability Office plans to probe the voter fraud panel's funding, internal operations and how it is protecting and sorting the tens of millions of sensitive voter files the commission has collected. The senators wrote that they fear the way the commission is conducting its work will "prevent the public from full and transparent understanding of the commission’s conclusions and unnecessarily diminish confidence in our democratic process."